Seldom will you see a residence of such distinction, which is unrivalled in every aspect and perfectly positioned in one of the most sought-after streets on the Gold Coast. 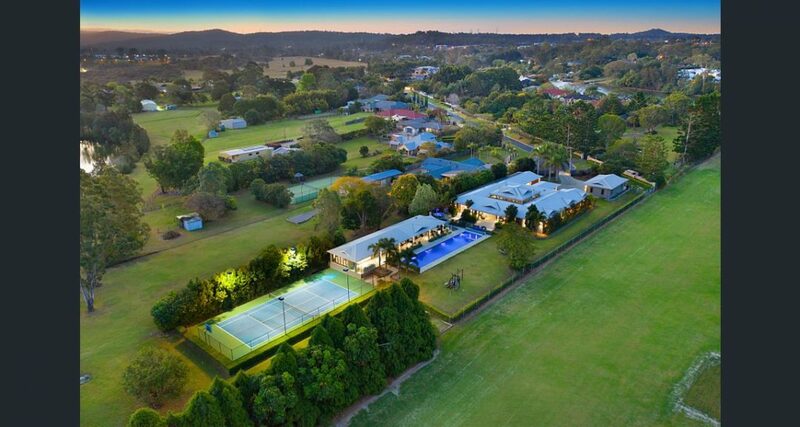 The rare opportunity now beckons to live amongst iconic acreage properties with this glorious gated estate, set out on a 6,139m2 (1.5 acre) block and offering a sense of seclusion and luxury. Grand in both size and appearance, you’ll be impressed from the moment you arrive. Boasting flawless marble, travertine, limestone and timber finishes, along with upscale RTI Panel home automation, no expense has been spared in this stately home. Offering the ultimate in sophisticated living and entertaining, multiple options await to unwind or host guests. The main living area, set under 15ft ceilings, is flooded with natural light and accented by a marble fireplace and bespoke joinery. It’s nestled next to the formal dining room and temperature-controlled wine cellar, with a gourmet kitchen with Butler’s Pantry, and a spacious media/games room with custom cabinetry and wet bar. The covered, limestone alfresco area delivers integrated living, linking seamlessly with the indoors. It steps down to the supersized 25m pool and separate in-ground spa, plus the superb outdoor kitchen with wet bar, and stone fireplace, sure to be a haven for family and friends to congregate. Outdoors also boasts a full-size tennis court, manicured grounds, an orchard and a superb pool house. This extra residence is ideal as self-contained guest quarters, with a bedroom, bathroom, two living areas and a kitchen or also acts as the perfect place for entertaining, with a servery window and an abundance of bifold doors which open up to fuse with the pool area. The oversized bedrooms will also entice, all presenting with ensuites, walk-in-robes, custom joinery and bifold doors for easy access to the lush grounds. The master suite features a sitting area, full height tiled marble ensuite with spa and dressing room. Additional superior features include a his’n’hers executive study with custom cabinetry, built-in-speakers and ducted air-conditioning installed, powder room and mud room, 8 car garage and stately Porte Cochere at the entrance, pristine hardwood timber and travertine floors plus beautiful panelled ceilings.